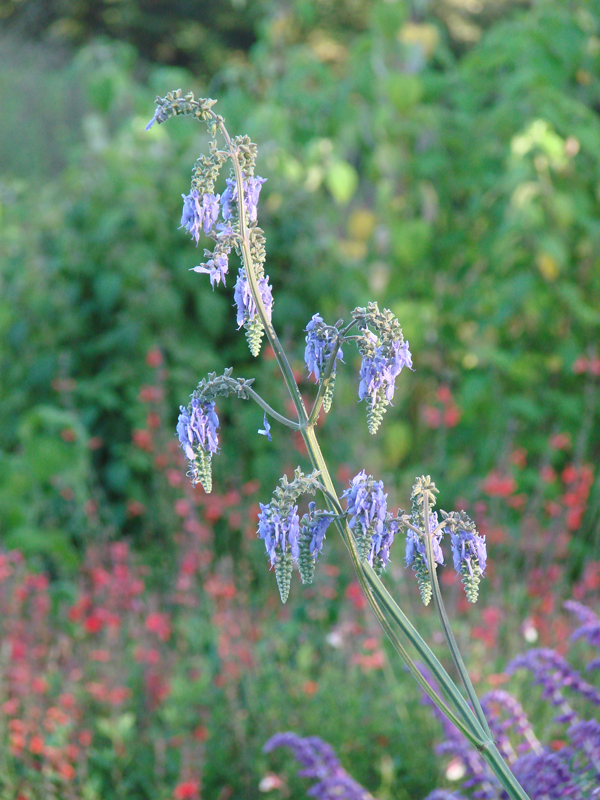 (Nodding Sage) "Dancing in the airâ" is how garden writer Joseph Tychonievich describes the tall, graceful flower spikes of Nodding Sage, which can tower up to 5 feet tall over the plant's 18-inch-tall foliage during the summer flowering season. (Nodding Sage) "Dancing in the air" is how garden writer Joseph Tychonievich describes the tall, graceful flower spikes of Nodding Sage, which can tower up to 5 feet tall over the plant's 18-inch-tall foliage during the summer flowering season. These are a slow growing sage, and often take a year to become established before blooming. 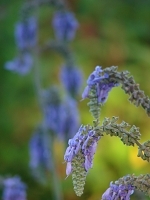 It's no wonder that one of Nodding Sage's many botanical synonyms is Salvia pendula considering the way the branches of the flower spikes curve at their tips with purple flowers dangling like bunches of grapes. As Tychonievich says in his Arrowhead Alpines blog, the flowers appear to be "suspended almost magically" over the large, green basal leaves. The appellation nutans in Nodding Sage's scientific name refers to the drooping or nodding character of the flowers. This sage is native to the meadow-steppe lands that stretch from Hungary across Bulgaria, the Ukraine and Russia to the Caucassus Mountains on the eastern edge of the Black Sea. Nodding Sage is cold tolerant to USDA Zone 6. Give it full sun and well-drained soil. 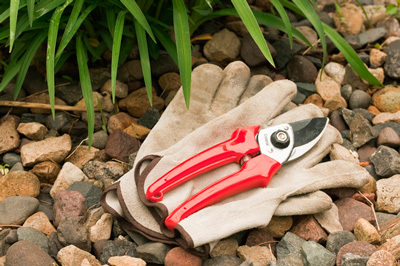 Although it appreciates average watering based on local conditions, it also grows well in dry gardens. 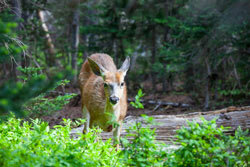 It is attractive as a groundcover or amid a mixed patio planter. Nodding Sage also looks lovely as an airy path edging or in a perennial border where the flower spikes can poke out above bushier sages. 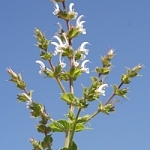 (Palestine Sage) With a wide range from Egypt to Turkey, this is a common perennial herb throughout the Middle East. The compact rosettes of gray-green heavily serrated leaves are quite distinctive, and the tall branched floral display of pure white flowers are reminiscent of the Menorah. 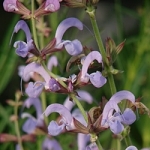 (Clary or Clear Eye Sage or Eyebright) Pink-purple bracts and violet-purple flowers form a pastel cloud over the large, rumpled leaves of Clary Sage in summer. It is a towering beauty growing up to 5 feet tall. Sacred to some due to age-old use in herbal remedies, it is heavenly to look at.